So why do I keep pushing Date Nights. Well, the latest research on how to keep marriages and families together says that Quality time together where a couple connects is one of the strongest indicators of marriages that last. So I want to encourage “Strong, Healthy Marriages” and give you some How-to’s so you can be successful. I receive a lot of emails telling me what is happening in Dalton so thought it might be helpful to give a quick run-down of some fun things to do, right here in our community without going 2 or 3 hours. This makes it a bit easier to get out. Of going on a dinner date is always fun, but what are come other things that you can do to reconnect. I like to encourage activities that are conversation stimulating. I don’t know about you, but there are times I just need to talk about something other than work or kids. John and I have lots of stuff, (as many of you see) that we enjoy doing together. Have you found an area that really floats your boat so that you just can’t wait to get out there and do this together? Well, maybe you can get some ideas from this. Let me know what you plan to do in June that might be a fun Date Night activity. This will actually start May 31st. What a wonderful time to stroll down our quaint little downtown and enjoy the evening. The first showing is at dusk and they will be showing Frozen. It’s not just for kids, I’m hearing how much adults love the movie too. Fun evening out together. The second showing is June 27th. Don’t know what that is yet. This is a great little show put on by Dalton Little Theater. It’s downtown at the old fire house. A great night to get a dinner at one of our restaurants from Date Night Dalton then go to the show. So much more fun to see live. You get the broadway feeling at a community price. Get some laughs and enjoy the evening. Try it!! How about some good old fashioned Gospel singing? On June 7th Big Brothers Big Sisters is hosting a Gospel Sing with Eldora Davis. A great evening to explore downtown. Gives you a time to enjoy our culture and fun, hold hands, enjoy the cool evening breezes and listen to some good old Gospel. Bring your lawn chair and enjoy. Here’s something a little different. 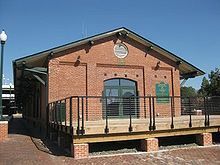 After you enjoy a nice dinner downtown or even just a coffee and dessert, go to the old Freight Depot and enjoy watching the trains go by. One time I was watching and the circus went through. You can talk between the trains and just enjoy the scenery. Once again, inexpensive and a quick little get away. We are almost in the heat of summer, so why not enjoy an early morning hike on the Disney Trail. It’s got some gorgeous views up there. A nice little get away. If you want to enjoy the discounts from your Date Night Card go the second week of the month, M-Th and stop at Brusters and get an ice cream after you have finished your hike. You get rewarded after the great exertion. There’s something for everyone. Date Night doesn’t have to be just dinner and a movie. Enjoy your community and time together. Remember why you got married in the first place. Go out and enjoy. Will bring more ideas later. Please give me your ideas too..